Ninoy Aquino's favorite song, they say, is "Impossible Dream." This certainly pertains to his efforts to attain the presidency, which whimsical fate eventually denied him. It would have been a common story about fate playing with people's lives, sometimes hurling the mighty to perdition and sometimes lifting vagabonds to wealth and power, had the tale not been broadened by bewildering events that would span decades. 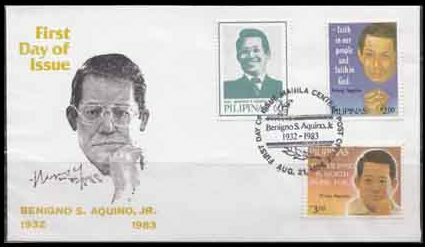 The First Day Cover above, postmarked August 21, 1986, commemorates the third death anniversary of Sen. Benigno Simeon "Ninoy" Aquino Jr., who was assassinated in 1983 upon arrival at the Manila International Airport. His brutal murder led to outrage and revolt. Even if in his solitary confinement at Fort Bonifacio, where he was imprisoned shortly after Martial Law in the early 1970s, Ninoy suffered surrealistic Kafka-Dali dreams, I think it never occurred to him that his wife, who visited him and brought him food, would eventually assume the seat he had intensely aspired and worked for. Surely not in his wildest dream did it occur that his death would propel his wife to the presidency. Only Ninoy can tell if he was teased or bludgeoned by fate. 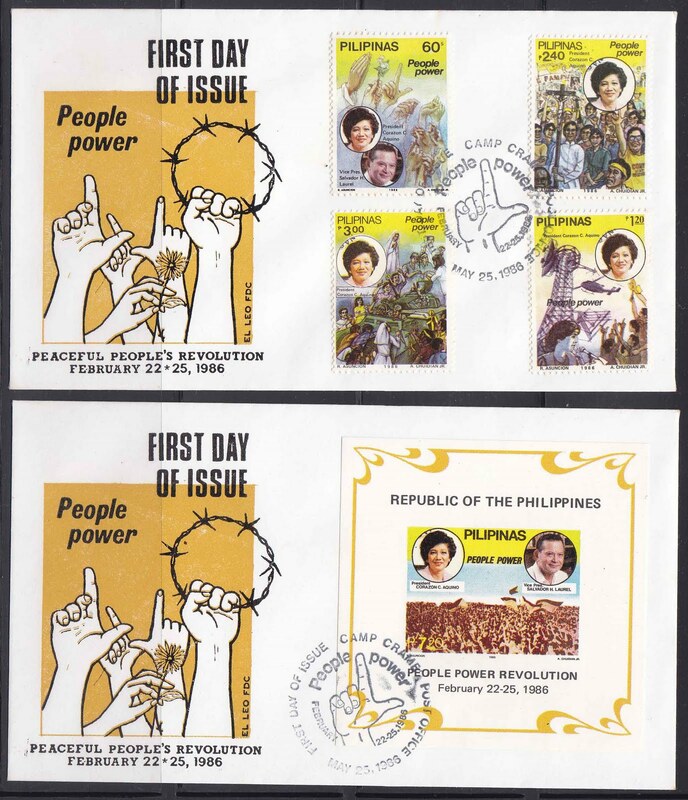 First Day Covers postmarked Feb. 22-25, 1986, Camp Crame, celebrating the People Power Revolution that validated Cory Aquino's right to the presidency, which she ostensibly won against Marcos on February 7, 1986. Marcos and Cory both declared victory, but Marcos was declared winner by the Comelec. 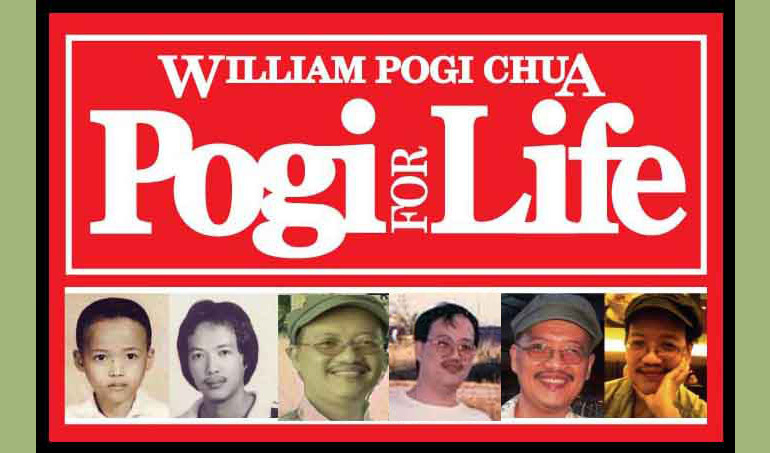 However, three weeks later, he and his family would flee to Hawaii when the EDSA revolt broke out. Cory turned over her seat to Fidel Ramos in 1992. Ramos was replaced in 1998 by Joseph Estrada, who was ousted two years later by another People Power. Vice President Gloria Arroyo served out Estrada's remaining term. Later, Erap would serve a term in prison for plunder. Arroyo was accused of cheating her way to another six-year term through the 2004 election; she is also suspected of outstripping both Marcos and Estrada in the art of plunder. 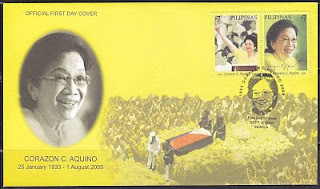 Anyway, in Aug. 1, 2009, Cory Aquino passed away, setting off a chain of events that will pressure his son, Benigno Simeon "Noynoy" Aquino III to run for the presidency. Surely Ninoy could not have foreseen his son will be the second President Aquino. 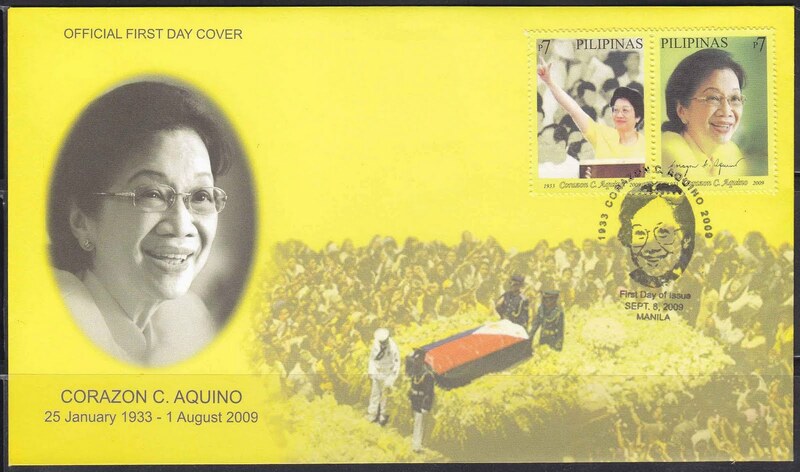 FDC above shows Cory Aquino's funeral on August 5, 2009. Postmark is Sept. 6, 2009, Feast of Mary. Noynoy buried his rivals with a huge electoral landslide in May 2010. 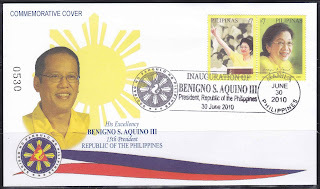 In June 30 he took his oath-of-office and became President Aquino II. 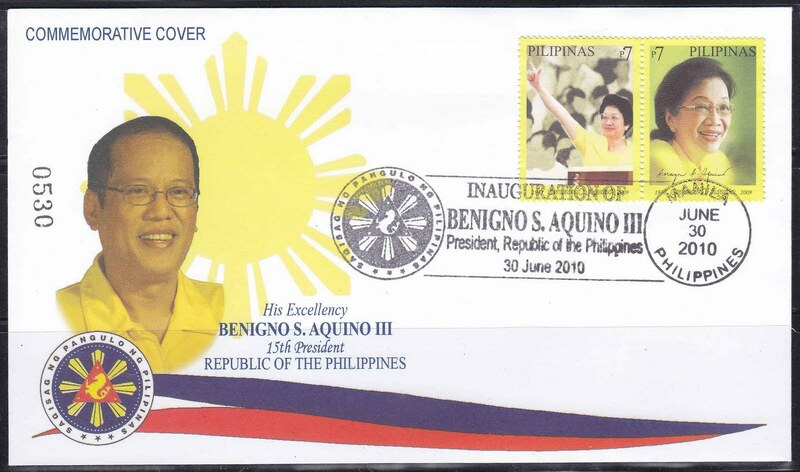 The Philippine Postal Corporation issued this FDC to mark Noynoy Aquino's assumption to the highest seat of this benighted land. 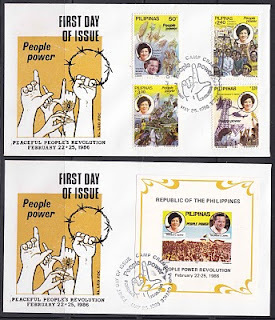 Cory, in the stamp, seems to be waving happily to his son here. 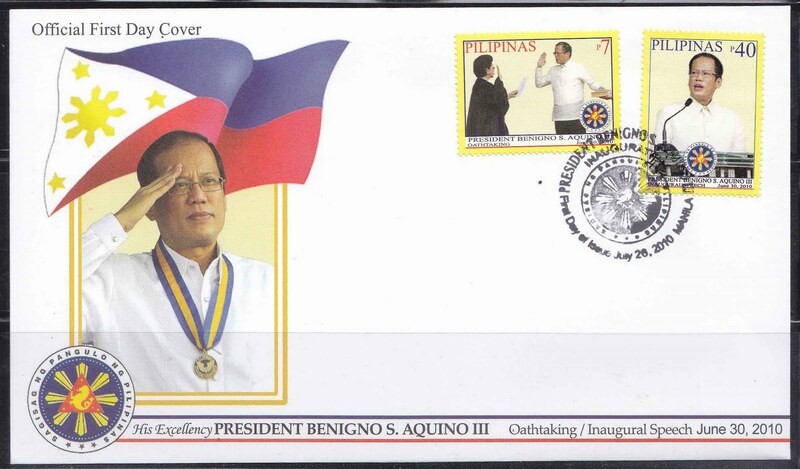 To those who are symbolically inclined, Cory in the other stamp is looking outward, towards a future lighted by the sun behind Noynoy's picture. July 26, 2010, is the postmark on this FDC, now affixed with a set of Noynoy's own stamps. It was on this day the new president delivered his first State of the Nation Address. What fate decrees next, I dare not speculate on. Imelda Marcos and her two children, one bearing her late husband's name, are back in power; four Arroyos have been elected by masochistic constituents to decent positions; Binay has become our first black VP, his son replacing him as Makati mayor, and a daughter serves in the House. The family that preys together stays in power forever. I have seen so many strange and cruel events to pretend to have the taste for more. hehe... the thought passed my mind; I shuddered and it vanished like a nightmare. Hi there William, i will be blogging about these stamps too, i hope it's okey with you if i use your pictures, will link you of course... please let me know if it's alright. I'll be glad to share, of course. 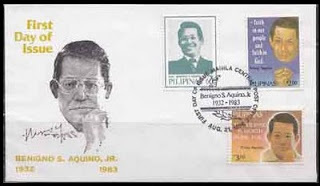 I'm interested too on what you have to say on the Aquino stamps. are these stamps still available? thanks. Oh, hi, I just returned to this site and read this. The covers were being sold at my ebay site when I made this blog. In fact, what I wrote in my description of the covers in ebay prodded me to write this. All the covers were sold, but I still have stock of the 2010 ones. Just visit ebay.com and search for "Philippine Stamps"; my username there is stamp.addict.